Forest Secret Challenge Rugs Revealed! 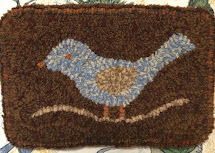 As promised the revealing of our Forest Secrets Challenge rugs took place today on the Rug Hooking Daily Site. 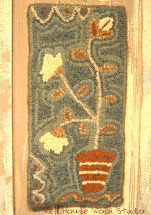 I am showing you my rug now and am showing the others whom I have been given permission from the designer. You won't believe the diversity in design and execution of these rugs! As always please respect the copyright rights of the designers. They are all original designs and not to be copied including the photos without the designers written permission. 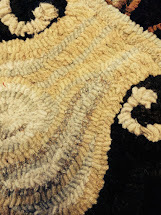 The Story behind my Forest Secrets Challenge Rug. 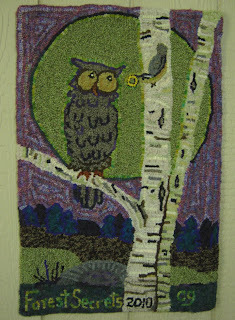 The owl on the birch tree was actually born from an idea I had before deciding to join this challenge. I had been wanting to hook a rug with an owl in it. The birch tree in my backyard was the inspiration for the tree and I took photos of the tree and looked closely at the many colors in the layers of bark. The birch trees took the longest to hook. 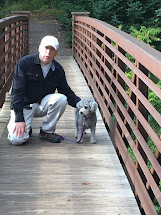 The idea came together after taking a walk on a wooded trail with my dogs. I thought how neat it would be to have a bird holding the ring! The ring being one of the required elements. The bird had to be a nuthatch as it had to be hooked with the birch tree as the background. That worked out good as that's the way you usually see these little birds going up and down the trees. The huge moon in the background wasn't in my original design. It came about when my neighbor and friend Lisa asked if it was night or day in the design. That got me thinking that I wanted it to be night and what would be in the night sky but a big lovely moon! Well, that got me excited and I had to add the moon after I had the owl and the bottom part already hooked. Out came one of my big wooden bowls that happened to be just the right size. I traced around it and made a few adjustments and I had my moon! 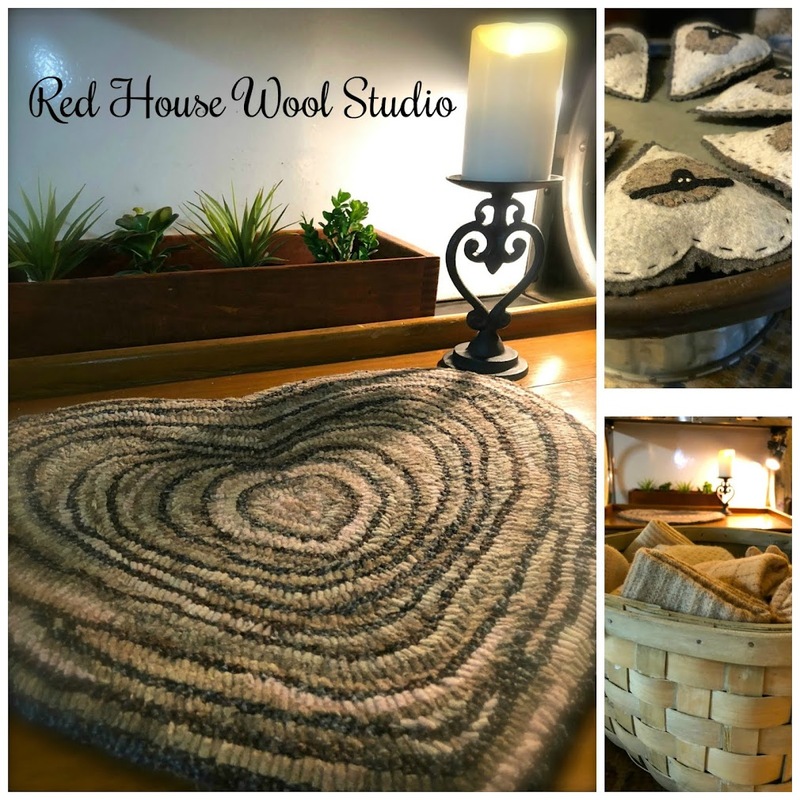 I used a lot of textures and wool that I dyed. However I didn't have to dye specifically for this rug. I had dyed some wool earlier just to have in my stash. I just pulled what I had and somehow it worked. 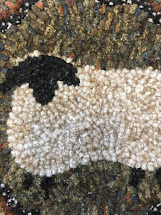 The one thing I'd do differently in this rug if I hooked it again (which I probably will never do) is play with the color of the moon with some hand dyed wool. I just used a texture I found and thought it looked kind of like green cheese! I always heard the old-timers when I was young saying that the moon was made of green cheese! So I decided to leave it. I think I could do something more interesting with some spot dyed wools that would make the moon shine a little. But now I think it looks like a moon in the night sky. Julia says: My story is about childhood memories of when I was a young girl. I was fortunate enough to have a forested area beside my home and spent many hours being by myself and daydream of running a household and having perfect kids. I foolishly wasn't satisfied of being a brunette and wished that I would have been a blond like my older sister. I really thought that blonds had more fun. I would hang upside down from trees, sometimes I would hang from only my feet. I was always having dialogues in my head and pretended all sorts of wonderful stories. Sometimes my friends would join me in the forest. The ring is an old tire tied to a branch, the rock on the lower right side was used to climb on the tree branch and the touch of purple is in the three flowers by the rock and also a narrow strip on the bottom of my tank top. I got out of my comfort zone by hooking in #6 cut for the first time. I used #3 cut on the flesh and tank top because that's what I started first. It's my first attempt at hooking a face, and to be on the wild side I decided to use alternate colors for the leaves with a darker outline. I've kept things simple because I wanted to have time to finish hooking on schedule. It's my first attempt at prodding also. I only dyed one shade of green for the leaves. 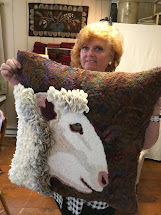 I used left over worms and all recycled wool except for the face which was new wool that I dyed with onion skins when I hooked the udder on my cow rug in 2004. Cynthia says: When I first read of the challenge, all I could think of was trees. I guess you could say, I couldn't see the 'forest' for the 'trees'. the shadow side of the moon. The ring around it reveals the secret that the moon isn't a crescent after all. Cicadas and the trickling of the nearby brook. . . with shadowy purple rocks. A quiet noise that is soothing and peaceful. #4 cut on linenPat says: When I thought of Forest Secrets with the rock being one of the essential elements, ‘what is on the rock’ and ‘what is under the rock’ was the first thing that came to mind. Initially the salamander was on the rock and there were little underground burrows with worms and snails etc in them. But somehow that didn’t work out the way I planned. Too much ‘dirt’ at the bottom. I have a cool rustic clay toad on my windowsill. Looking at him I had an aaaah-ha! moment. 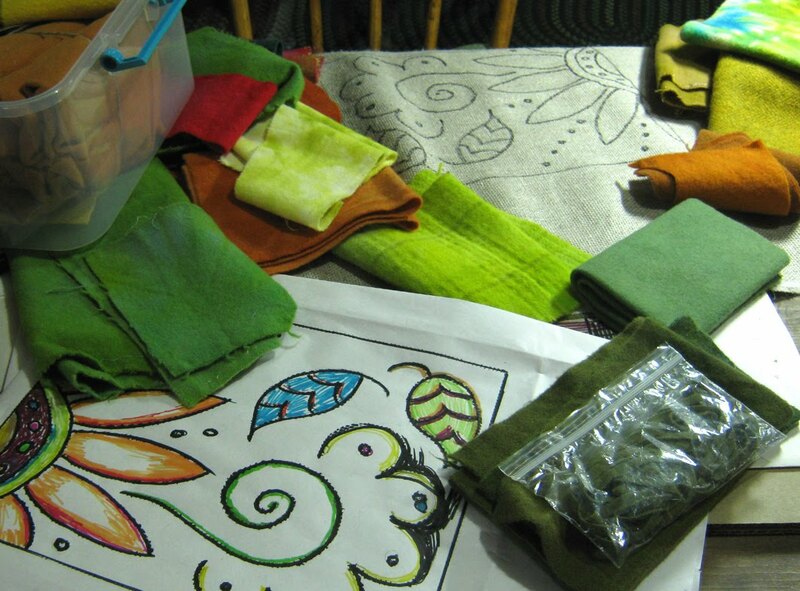 I planned to put sprays of fall oak leaves around the border of a rectangular rug. None of the designs that I arranged were pleasing to me. I decided to be more critter oriented. I don’t know what made me think of the moths. I guess the fact that toads eat them was a factor. I have always been fascinated by the large lovely saturniid moths. The colors of the IO moth were just right. And there are rings on the underwings! 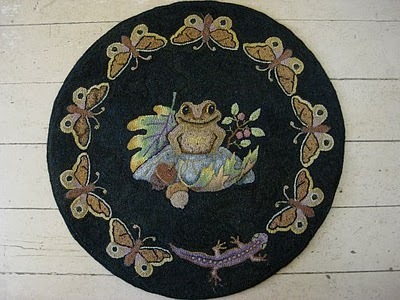 So I started calling the rug ‘Toad Thoughts’. Of course there was the purple. I’ve never personally seen a purple salamander, but…. All the colors were either small pieces out of my stash or larger pieces that I dyed. The leaves are one of my first attempts at dip dying. To get the necessary detail, I used a #4 cut. Luckily I ordered the blade a week before the announcement of the closing of the Townsend company! My backing is monks cloth. The rug is 27 inches across. There were a few reverse hooking incidents when the colors weren’t quite right, but the whole thing went amazingly well. I don’t usually work in such a fine cut. I thought it would take forever, but not so. Number 4 cut hooks quickly because the loops are so easy to pull through the backing. This was a truly enjoyable project! 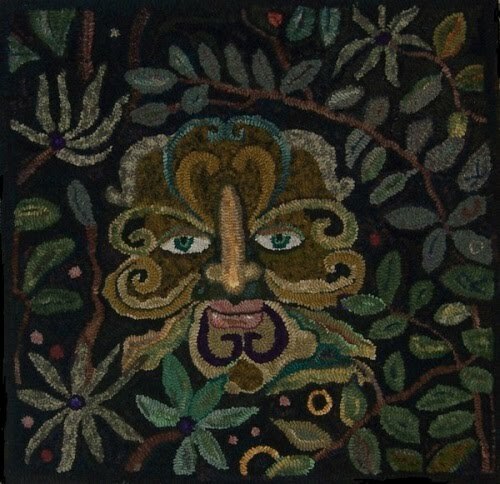 Sunnie says: My rug is titled - "The Watcher" and is loosely based on the legend of the Green Man (the forest spirit). Sometimes, when walking in the woods or a forest of trees, there will be just a flicker of motion that I see. But when I turn to look, I can't see anything there! I wrote a poem, a Haiku, to keep me focused on my theme. Sunnie says: I wanted the Watcher to be mysterious but peaceful and be a celebration of life. I like to think that, when I am walking in the woods, there is a benevolent spirit watching over me and all those who live or travel there. 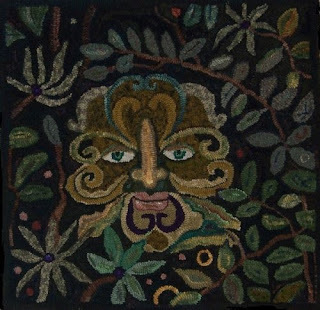 The "gold ring" is plain to see at the bottom of the piece and the "touch of royal purple" is on the face and in the center of some of the leaves. I had intended to add a real rock to my rug but decided to be "creative" and ise the veins of the leaves n the right to spell our the word, "R-O-C-K"...so I got around that rule!!!!! I had such fun with "The Watcher"...and learned a lot too!!! These are only a few of the rugs and their designers who participated in the challenge. 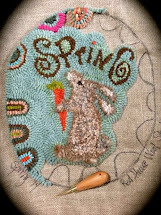 Here is a link to the Forest Secrets Challenge Group on the Rug Hooking Daily Site. It will bring you to the rest of the rugs! 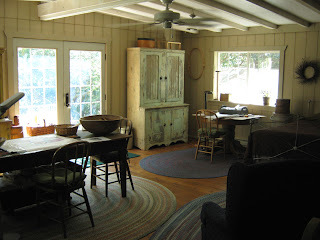 Click on each rug photo for more! Hope you enjoyed the rugs! My blog header this evening is a photo I took of a White-faced meadowhawk dragonfly feeding on the hanging licorice plant in our back yard. I'm quite proud of the fact it made the outdoor section in our local newspaper. Of course my hubby Dave is the editor in that department so I guess I sort of had an "in"! But clearly I must be getting a little better at photo taking otherwise he wouldn't have considered using it even if he is married to the photographer! It's interesting that I'm not using any sort of special lens or a fancy camera. All I use is my trusty little red Canon Power Shot A480. 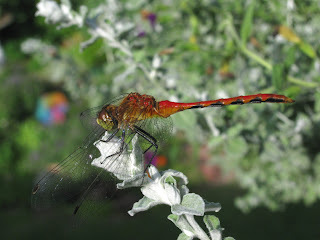 I am going to share some of my photo taking tips in a future blog so watch for that. 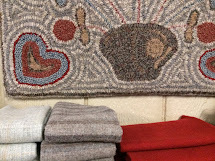 I may have gotten carried away with the photo's I took of Mary's rug all completed and ready to deliver to her house. I made sure I took photos of it at all angles in different spots throughout the house. Silly isn't it. If I ever want to visit it I can just walk down the street a few houses. Mary is my neighbor. Any how I made a nice little cotton label for the back of it using my computer and printer. Kind of gives it a nice professional touch and personalizes it for Mary! So tomorrow I'm off to deliver it and hopefully come home with a little jingle in my pocket! 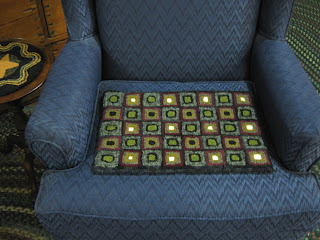 I'm hooking on another little mat with some penny circles while waiting to start the next rug for Mary. Right now it just seems good to have something on the frame that I don't have to think that hard about. It feels good to just pull loops. Just another little reminder that the secret challenge rugs are going to be revealed this Fri. I'm getting butterflies now! The rug above is my original rug I hooked for myself. 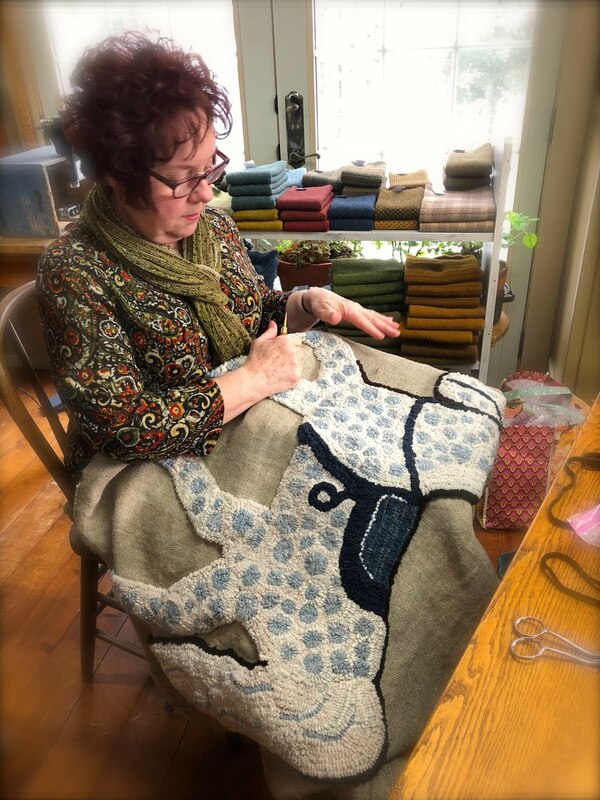 I'm learning that hooking a rug for someone else who is paying for my work is a horse of a different color. I'm detached. Big time! Maybe you seasoned hookers know what I'm talking about. 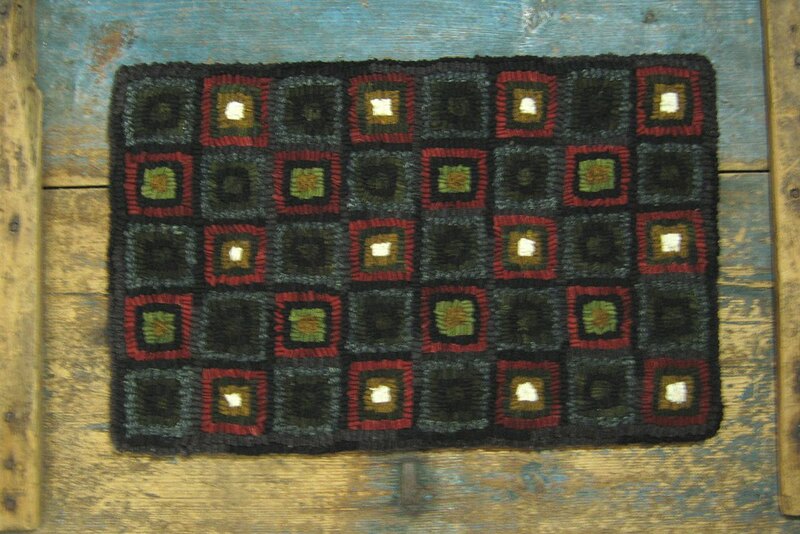 I want this rug to be one of my best ever. 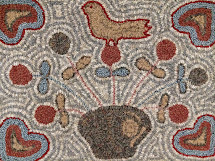 I know Mary is going to "show and tell" this rug to every single person who comes to her house. Whew! I have been hooking and rehooking and measuring and remeasuring. Cutting a lot of the strips by hand. Cursing this soft linen on which I love to hook, wishing it was a tad bit firmer. I think the geometric design would have been a little crisper......in short, obsessing. Notice the white "lights" as I like to call them. 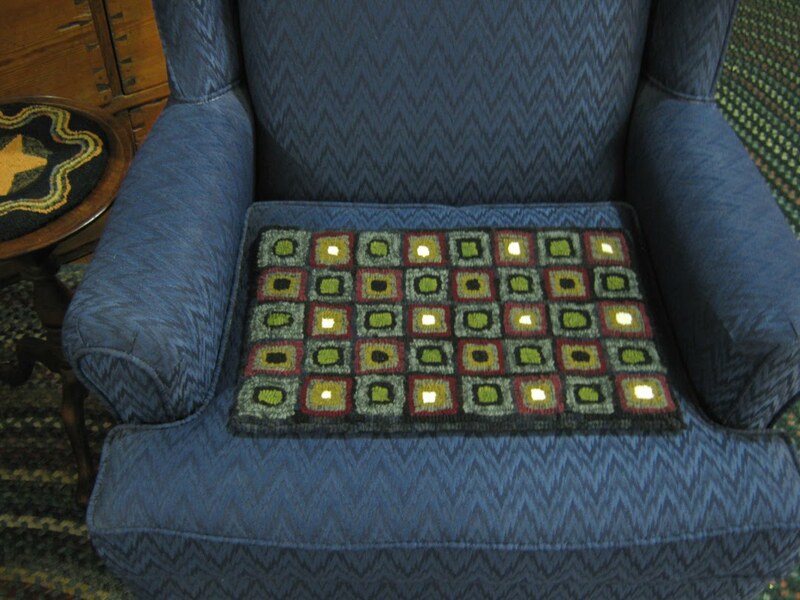 In my original rug that I hooked for myself I didn't seem to mind that they didn't come out even leaving the last row of squares without any lights. In fact I guess I never noticed knowing it was for my own use. 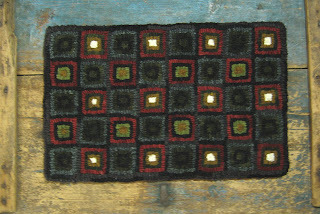 In Mary's rug I have in my head the "white lights" needed to be in the last row of squares. In order to do that and keep the pattern even throughout I would have had to add another row. Not an option here as it has to specifically fit the night stand next to Mary's bed. 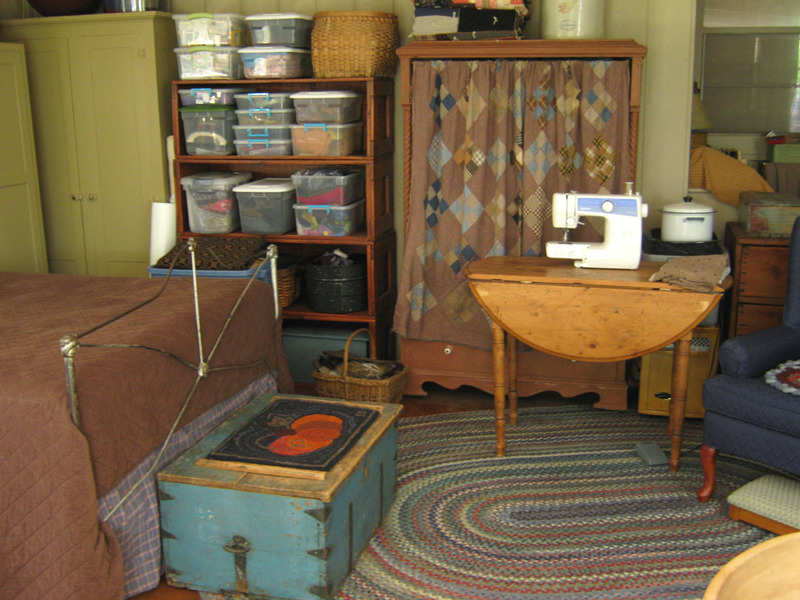 The picture here, shows the rug as it sits now. However, I think I am going to move the white light in the 5th row over to the 6th row. Any opinions? Hooking detached seems to have made a difference in this rug. I like to believe I am putting my whole heart and soul into it. After all it is a reflection of me. It will be out in the world for all to see. Hmmmmm....Maybe I'm not cut out for these commission rugs......or maybe I'm just obsessing. This weekend (Fri. the 30th we will be revealing our "Forest Secret" challenge rugs! I will be posting mine here for you to see and also I need to get permission to show the others who participated in the challenge. What fun! I can hardly wait to see the designs and rugs of everyone else. It will be really interesting to see how everyone interpreted the "Rock, Ring, and a touch of the color Royal Purple keeping the theme Forest Secrets. So stay tuned! A few days ago my neighbor friend Mary stopped by with a friend of her's who was visiting. 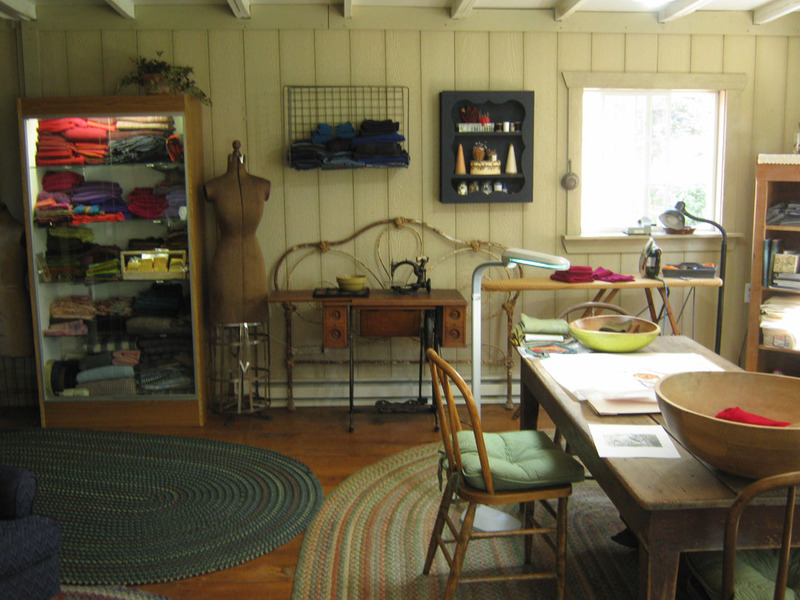 She wanted to see my studio and my hooked rugs! I happily gave them a tour which ended up being my whole house as Mary's friend loved looking at my antiques! 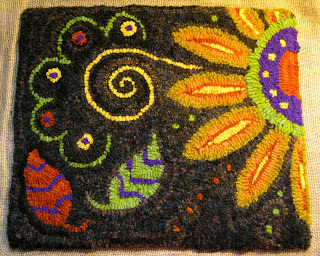 Mary spotted this little hooked mat I did some time ago. As it turns out she has a little table in her bedroom that she wants me to hook one just like it for her. Actually she wanted to buy this one as she really was taken with it! Okay, maybe it's just me but these are thoughts that started racing through my head...... (1) I hooked this mat for use in my home and have been using it in various places, setting coffee mugs and cold drinks on it. (2) I dyed some of the wool I used in it and of course didn't save the formulas so probably will never be able to get the same colors (3) what would I charge her? After all she's my neighbor and friend who keeps giving me jars of her home made raspberry jam! (4)I know I could hook her one that has colors closer to what she has in her bedroom and she'd be happier with that (5)I happen to love that little mat and really hadn't planned on selling it.......have you got the drift? Can you see my dilemma? 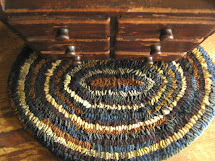 It's crazy with these hooked rugs I've made. It's almost like they have some sort of soul (my soul) hooked within their very fibers that if I should be parted from them something will happen. What, I don't exactly have that figured out yet. Silly me. As it turns out Mary will be happy to wait for me to hook her own special rug! Sort of like a commission. I have done one or two commissions for various people. 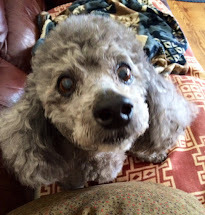 It seems as though if I know that the rug I am hooking is going to live with someone else, I don't develop the same soul attachment as the ones I hook for myself. 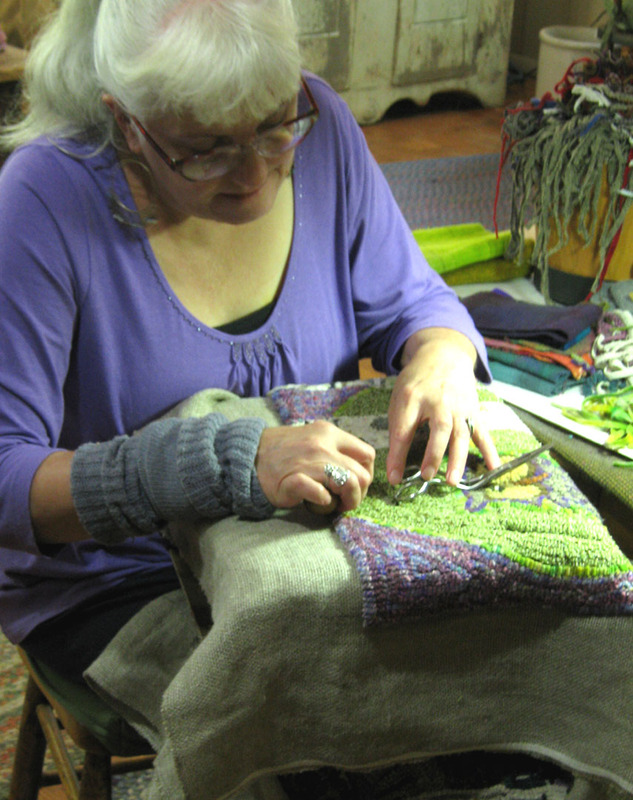 During the process of making the rug I am always thinking of it as their rug. There must be some sort of name for this strange way my brain behaves. CPD (Compulsive Possession Disorder) Okay, I just made that up. 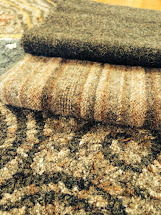 Anyhow I will be starting "Mary's rug" this afternoon. 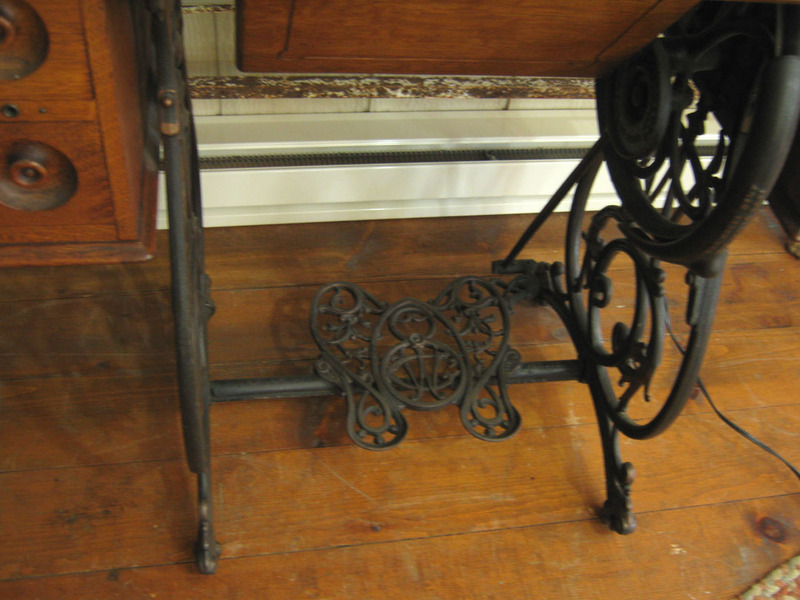 She also has a nice little antique side table in her living room she'd like a mat for too. I'll keep you posted on the progress of "Mary's rugs" as they shall be referred to from here on. All Hooked With our Heads in the Clouds! 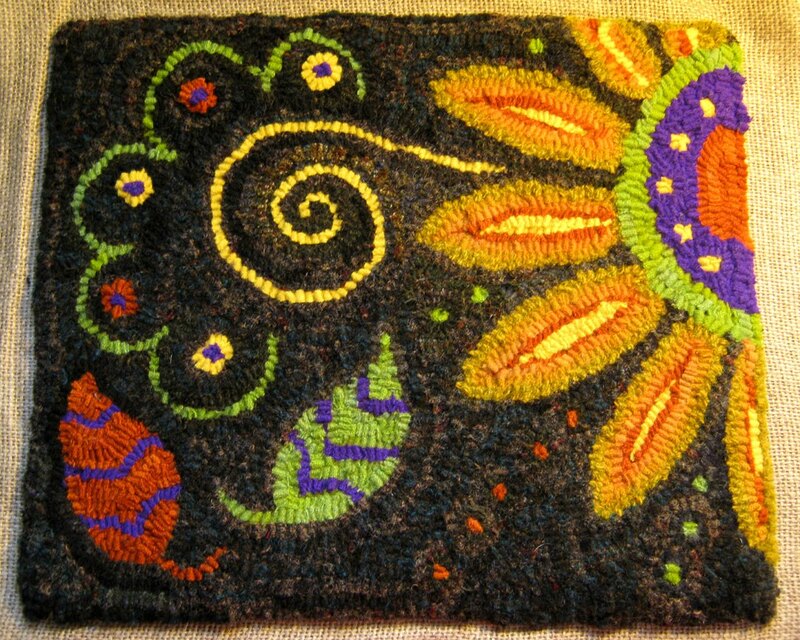 The hooking is done on my Sassy Sunflower rug! Thank-you all from the bottom of my heart for your sweet compliments on this little mat! I'm always thrilled when I get a nod of approval for a design that just sort of popped into my head! 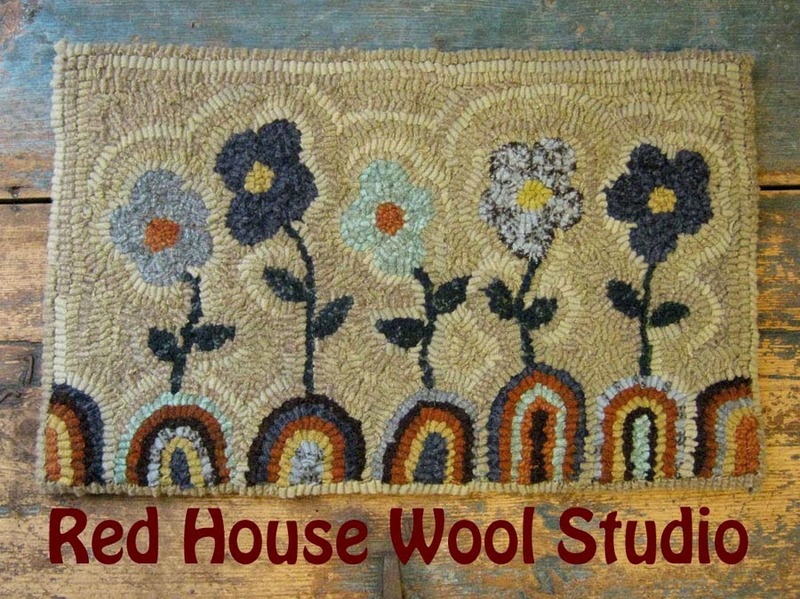 I have been wanting to do a sunflower rug for quite some time. I have also been working on a fall leaf design. So I guess that is where the leaves came from in this design, as I've had leaf designs floating around in my brain lately! I just had to share these photos I took night before last of a spectacular cloud display in the sky right after a thunderstorm rolled through. Dave was talking on the phone in a long conversation that couldn't wait. I called him out onto the deck to see these clouds that were changing and becoming more spectacular by the minute. He was yakking and I was snapping photos as fast as I could. Here are a few of the more than 50 shots I took before they all drifted away and darkness settled in upon us! Yes, you could say we both had our heads in the clouds that evening. It's a good thing Dave doesn't know how to text or he may have missed the whole thing! Time for a new pattern! A smaller mat this time drawn quick as a wink. I needed a color fix! Yes indeed! What do you think of this Sassy Sunflower? I think I will be hooking this one in different shades too. I'll be back with more in the next couple of days. 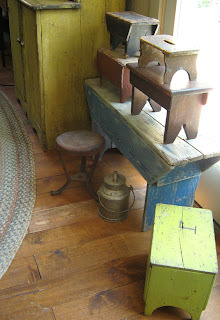 Just for fun I decided to gather my collection of primitive milking stools all in one spot. One can never have too many of these little primitive treasures! One is metal and rusted to perfection. A few of them have traces of the old paint. 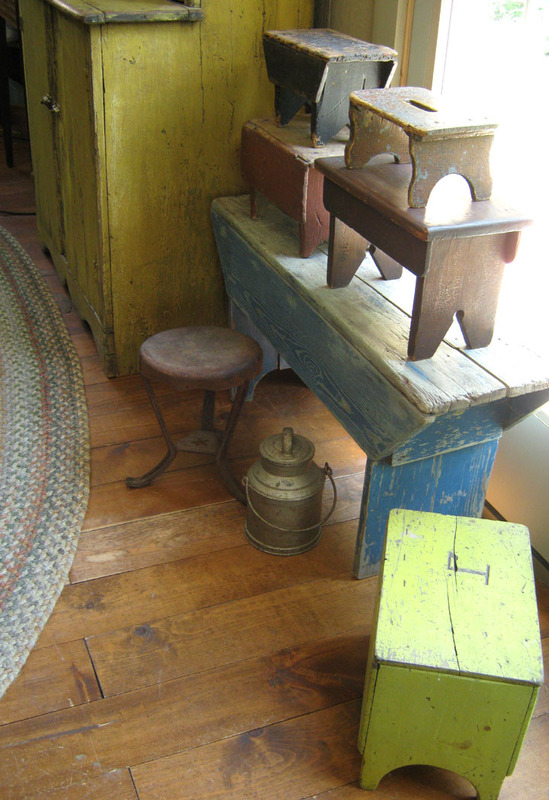 So if you have the milk cow and are milking by hand, I have the stool for all your milking needs. 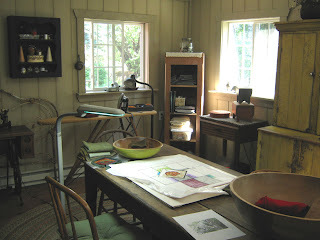 Just so you don't think that all I did was play with my antiques, I did get some organizing done. A corner of the studio actually got cleaned and those wool worms are starting to find a home in some nice plastic containers. Although I'd prefer wooden boxes to store things, I'm foregoing the "primitive look" for storing the majority of my wool. So this is as clean and organized as it gets. 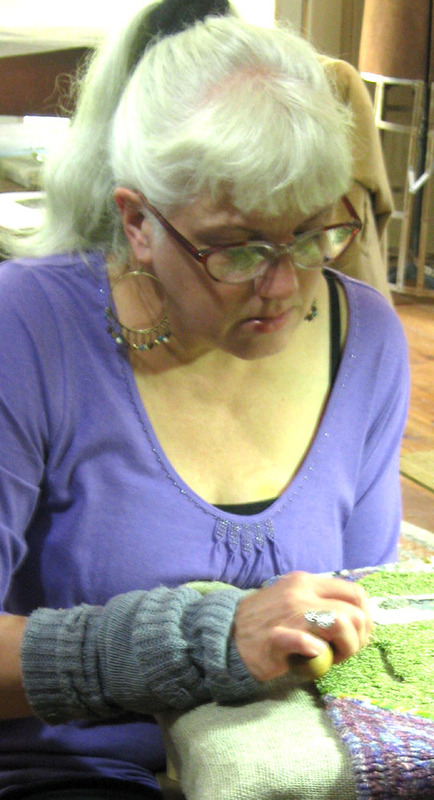 I have a new pattern on the drawing table and am putting some final touches on the design. The secret challenge rug is done and hanging on the wall above the bed in the studio. I'm dying to show it to you, but the reveal date is a couple of weeks away yet. I'm glad you stopped by today for a visit. 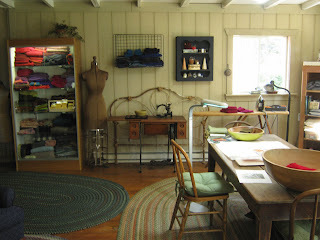 And I'm even happier that the studio was half-way cleaned and presentable! Now how often does that happen? Once in a blue moon! Here I Go Again! Another Art Show! Opening Friday, September 3 through Tuesday, September 28. Reception for the artists on Friday, September 3 from 4 to 6 p.m.
Twelve artists from the Chetek area have come together to show their diverse work at the Heyde Center - a lot of talent from such a small part of our state! John Baldini, an impressionist from Venice Italy, moved to Bloomer to farm and raise cows, Mark Canfield is a ceramist, CJ Conner is a painter who describes herself as a “self-learning artist with an overactive imagination”, Nancy Erickson Dutmer works with mixed media to create rustic art, Gene L. Green, a retired architect, has worked with watercolor for 60 years, Cathy Greschner is a “fiber fanatic” who uses wool in her rug hooking as an artist uses paint. Patricia Hamm works in fluid acrylics, watercolor and liquid watercolor, Audrey J. Kaselau uses a variety of mediums; graphite, oil, paper mache and metal sculpture. Ray Kaselau works in traditional and digital medium as well as corrugated sculptures, Kim Losse studied the art of Raku pottery in Japan, Brian Marsh’s photographs have appeared in area tourism guides, Don Olson, inspired by the natural world, paints with oil and acrylics. There is no admission charge to the public for this exhibit. I can't believe I'm doing this again! This time we are a group of artists participating with many others at a very well established Art Center in the Chippewa Valley! What do you say? I suppose I better get Hookin'!! Happy Canada Day to all the wonderful Bloggers there!